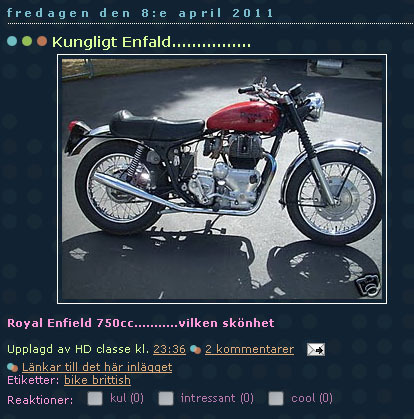 RoyalEnfields.com: Quick, officer, Follow this Royal Enfield blog! Quick, officer, Follow this Royal Enfield blog! This blog, Royal Enfield Motorcycles, is hovering at 199 "Followers on Google" as I write this, and may surpass 200 before I finish typing. Royal Enfield Motorcycles began publishing in July, 2008, and reached 100 Followers in April, 2010. For one thing, it may mean that Google is way behind Facebook in the battle of Social Media. My RoyalEnfields.com Facebook page has, at this writing, almost 500 people who have joined up by "Liking" the page. I've been on Facebook only since July, 2010. If you're a member of Facebook, PLEASE go to my Facebook page now and "Like" it. Now that you're back, please note that Following this blog, by simply clicking on the "Follow" button in the widget in the sidebar at right, has some advantages for you. For one, you will be able to read this blog conveniently in Google Reader or on your Blogspot Dashboard. Just as interesting, you will see who ELSE is reading this blog and be able to click through to see what they're up to. Google translates that as: "is a man.med nostalgic flashbacks, like everything about cars mc aircraft, and radio." You can see what he's up to at HD Classes Blogg, which is All nostalgi,och andra kul grejer, meaning, "full of nostalgia and other fun stuff." That includes pictures of Royal Enfields, other motorcycles, pin-ups and Elvis. "Google is not just about search anymore," the company writes. "It’s about social connections and finding community on the Web." Once you Follow this blog, you'll be able to see who else you know is Following and send them messages. You can meet new friends as well. Even if your dance card is full, please become a Follower. It will encourage me to keep writing this blog. Welcome to my community: Please Follow this blog. I hope you are not thinking of stopping this blog!!!! I think your blog is fantastic. Just a thought, how does one get more followers? I notice that the 199 has transformed into 204.... bring on 250.